Vortex Diamondback riflescopes completely change the rules when it comes to "you get what you pay for." Due to the solid one-piece aircraft-grade aluminum alloy construction, Diamondback scopes are virtually indestructible and highly resistant to magnum recoil. Argon purging puts waterproof and fog-performance on the checklist. 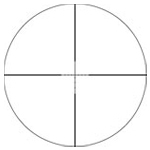 Crystal clear, tack sharp images appear in the cross hairs with the fully multi-coated optics. You would expect a feature-heavy scope like the Vortex Diamondback to cost an arm and a leg, however, it doesn't. Enjoy Diamondback scopes for less than you'd expect! While Vortex Diamondback riflescopes are equipped with many features, these scope accessories will take your scope to the next level. From scope rings to lens caps, EuroOptic has a wide selection of accessories that will be sure to meet your needs. Scope Weight: 12. 8 oz. Field of View: 68.3' - 23.1' @ 100 yds.